The Saltwater Mussel has a shell with a thick profile and a pointed anterior end. There are strong radial ribs and transverse growth lines on the shell that give it a rough appearance. The outside surface of the shell is usually eroded and a blue-black color. The interior side of the shell is blue-gray in color and may appear iridescent. The Saltwater Mussel attaches to hard rocky surfaces through the use of byssal threads. It ingests food by filtering up to 2-3 liters of seawater per hour. Spawning occurs year-round, but peaks in July and December. The Salwater Mussel is common in the intertidal zone of rocky coastal areas. The Saltwater Mussel are a major source of sea-food for humans and are also farm-raised for consumption surfaces. Consumption of Saltwater Muscles by humans dates back thousands of years to coastal Native American peoples. Cowles, Dave. "Mytilus californianus". Wallawall.edu. 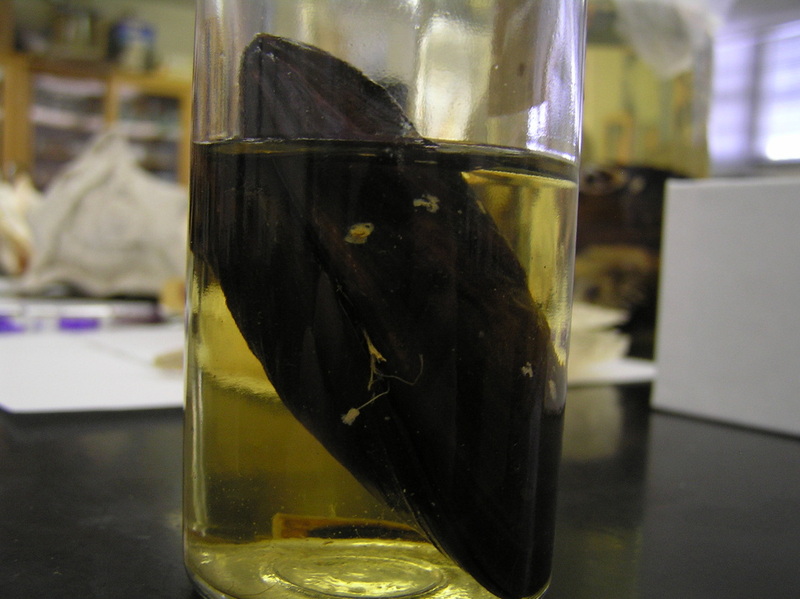 Retrieved from: http://www.wallawalla.edu/academics/departments/biology/rosario/inverts/Mollusca/Bivalvia/Mytiloida/Mytilidae/Mytilus_californianus.html.